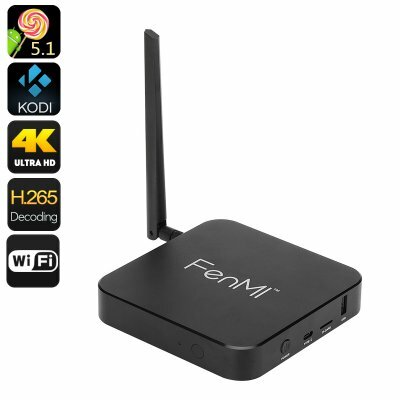 Successfully Added FenMI FMX1 Android TV Box - 4K, Android 5.1, Wi-Fi, Bluetooth, H.265, Octa Core CPU, 2GB RAM, Miracast, DLNA, Kodi to your Shopping Cart. The FenMI FMX1 Android TV Box takes your home entertainment a step further. It brings you all the joys of Android interface in a nice compact form. With the support of 4K resolution, Wi-Fi and Bluetooth, you are getting everything you need for a great movie night. The FenMI FMX1 Android TV Box comes with Kodi media player already waiting for you. Kodi is a dedicated media player with loads of features. It can play your media, display your photos and videos. One of the major benefits of the open source media player is the ability to turn to third-party add-ons and get access to almost all the content that is available online. With Wi-Fi and Bluetooth 4.0, the TV box sports great wireless connectivity with other devices. Hook up external speakers, headphones and more. will also be able to fully use 3 USB ports, HDMI and an SD card slot as more media sources. Setting it apart from the competition this TV Box has a USB Type C port for speedy connections ot the latest gadgets and ensuring a fully future proof device. Boasting 16GB of internal memory that's expandable via the micro SD card slot this media player offers lots of storage space and thanks to H.265 compression, you will be able to store more media without compromising the quality. The TV box is powered by the RK3368 Octa Core CPU — a great set up for multitasking. You will also have the Power VR SGX6110 GPU to back up your gaming fun. With DLNA, Airplay and Miracast, you will also get lots of sharing options. The FenMI FMX1 Android TV Box supports a 3G dongle (not included) for more connectivity options. The FenMI FMX1 Android TV Box comes with a 12 months warranty, brought to you by the leader in electronic devices as well as wholesale Android TV boxes..